A hearing on the former Cushman Tavern is set for Tuesday night with Lisbon and Sabattus officials. SABATTUS — A former tavern listed on the National Register of Historic Places for its 1820s frescoes featuring oversized trees, ships and old New England charm is being considered Tuesday night for demolition. Town officials say after a period of neglect, its roof is caving in and there is no obvious solution to saving the paintings. The former Cushman Tavern sits at either 921 Middle Road in Sabattus or 430 Ridge Road in Lisbon, depending on the direction you approach it. “It’s one of the oldest buildings, I’d say, in Lisbon, but at the time it was Webster, Sabattus and Lisbon combined; hence while it’s over a line,” said Dennis Douglass, the code enforcement officer for both Sabattus and Lisbon. 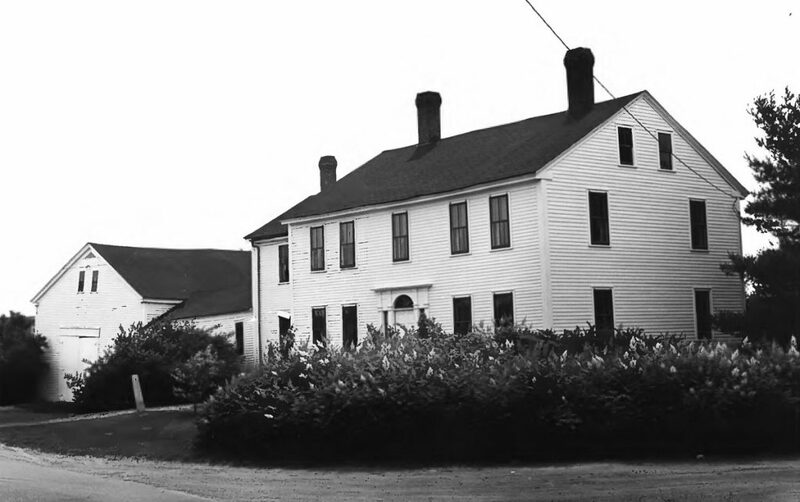 Shortly after the Federal-style building was built about 1825, Auburn artist Orison Wood knocked on the door and said he “could paint the walls with marvelous decorations which would help to advertise the Cushman House far and wide and make its name notable on the lips of the traveling public,” according to the Maine Historic Preservation Commission’s 1979 application to the National Register of Historic Places. The large frescoes are in the first and second floor hallways as well as in the stairwell. 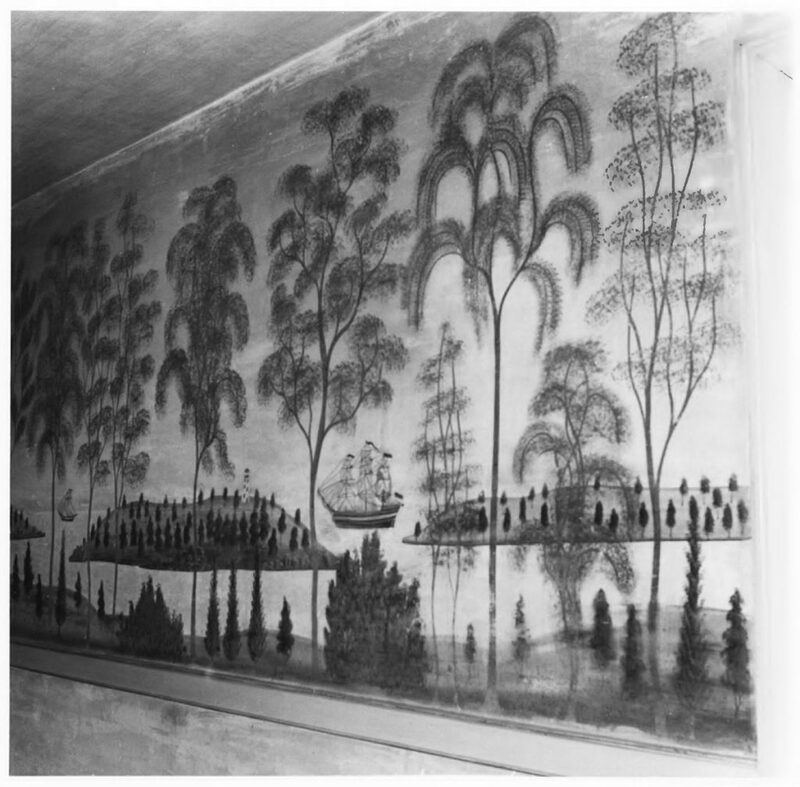 A fresco painted by Auburn artist Orison Wood in the 1820s inside the former Cushman Tavern on the Sabattus-Lisbon line is shown. Lisbon and Sabattus officials will consider declaring the building dangerous and ordering it be razed. Capt. Samuel Cushman ran the property as a tavern and it later became a private home. Douglass said he initially flagged the house as an issue to the town of Lisbon after watching it sit vacant and start to “structurally fail.” It is now due for a dangerous-house hearing at 6 p.m. Tuesday in Lisbon with the Lisbon Town Council and Sabattus Board of Selectmen. “From the front, it looks not that bad, but you look from the backside, you see where the roof is collapsing in,” Sabattus Town Manager Tony Ward said. In 2007, Sabattus assessed its share of the house and land at $172,900, according to an online tax map. Lisbon has its section assessed at $32,000, according to Town Manager Diane Barnes. The property is owned by Pamela McGuire and the heirs of Robert McGuire. Taxes are current in both towns. Should the towns choose do it, the project would be put out to bid. “But Lisbon’s experience is these demolitions cost approximately $10,000,” Ward said. Douglass said the towns have talked with the owner about saving the property, but it was too late. “I’ve had a lot of people look (at the murals) and been told that (removing them) is possible, but no one has stepped forward with the means to do it – that’s beyond my expertise,” he said. Barnes said she expects the council and board to take some kind of vote Tuesday. “It’s unfortunate” to lose a building on the historic register, she said.